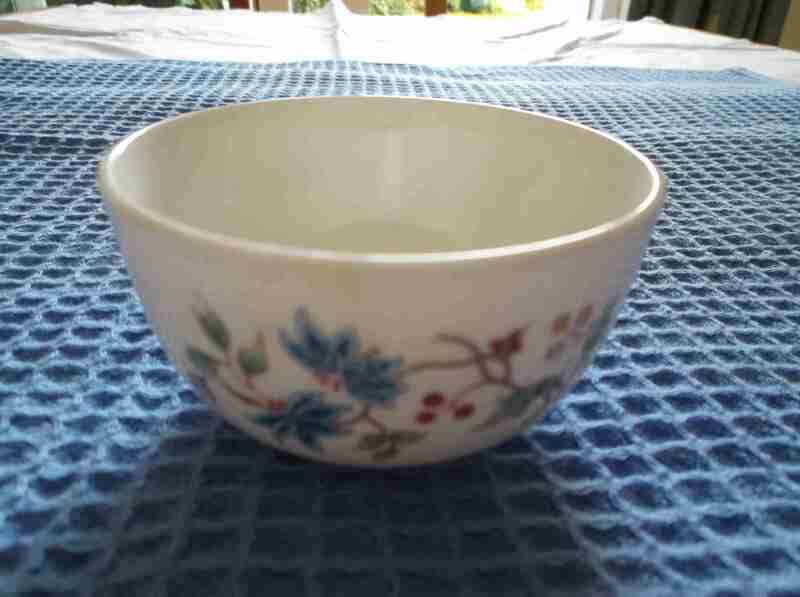 DESCRIPTION -- Royal Mail Line shipping company as used on board 'Bird of Paradise' design sugar bowl. It is 3" (8cm) wide and is in a fantastic condition and is bottom marked RML (click on the picture to see base). HISTORY -- The Royal Mail Line was originally founded as the Royal Mail Steam Packet Company in 1839. It was responsible for services between the UK and the Caribbean and Central America and North America. The company was purchased by the White Star Line in 1927. In 1932, it changed its name to the Royal Mail Line and re-organisation after scandal and losses. In 1965 the RML was purchased by the Furness, Withy & Co. 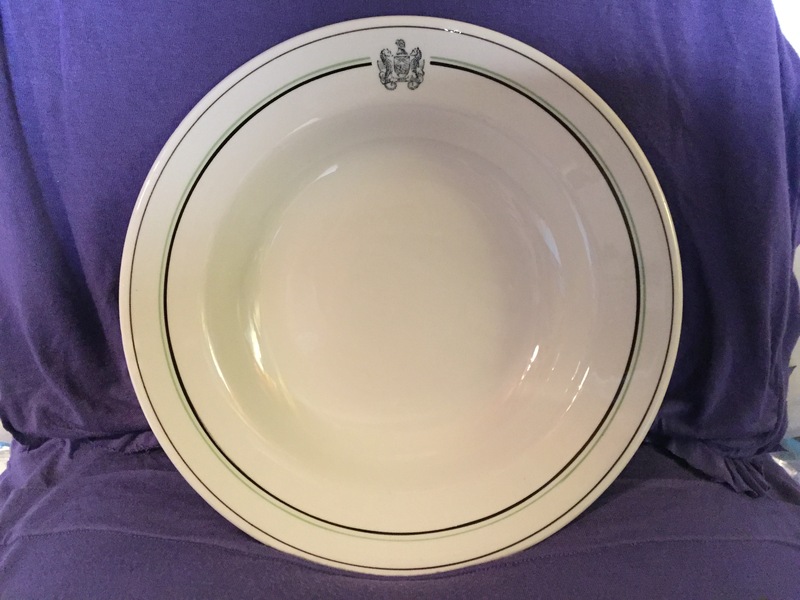 DESCRIPTION -- From the Royal Mail Line shipping company this is an as used on board 'Bird of Paradise' design dinner bowl which is 6" (15cm) wide and is in a fantastic condition and is bottom marked RML. DESCRIPTION -- Original cup and saucer from the Royal Mail Line shipping company which is in a fantastic condition and dates from around the 1960's. HISTORY -- The Royal Mail Steam Packet Company (Royal Mail Lines) was a British shipping company founded in London in 1839 by Scot James Macqueen. After good and bad times it became the largest shipping group in the world in 1927 when it took over the White Star Line. The company ran into financial trouble, and the British government investigated its affairs in 1930, resulting in the Royal Mail Case. DESCRIPTION -- Large size B/W photograph of the old vessel 'The Delphic' one of the Shaw Savill & Albion Line's most famous ships from a large seagoing fleet. The photograph is taken from our collection of over 2000 shipping photographs and it is in a very good condition with the size of the photograph being 10" x 7" (27cm x 17cm) and dated as being taken in the 1960's. HISTORY -- The combined Shaw, Savill & Albion Line was created in 1882, but Shaw, Savill & Co retained five sailing ships, and John Leslie & Partners ran their ships with this fleet. Shaw, Savill & Albion Line also ran a joint service to New Zealand with White Star Line from 1884 to 1933, when the collapse of the White Star Line enabled the service to be taken over completely by Shaw Savill. Shaw Savill continued to use White Star-style names with the suffix "-ic". In 1933 control of Shaw Savill was acquired by Furness, Withy & Co. DESCRIPTION -- Souvenir from the Royal Mail Line shipping company which is a clear glass front cigarette case showing on it the RMS Andes and the name of the vessel. A rare find and is in a great condition. DESCRIPTION -- Silver-plated salt pot from The Royal Mail Line and the 1930's and is in a good condition showing on the front the company houseflag and is an as used onboard item with the size being 3" (8cm) high (click on the picture to see a close up view of the houseflag). HISTORY -- The Royal Mail Steam Packet Company received the mail contract for the West Indies and commenced operating in 1841. A West Indies inter-island service was also operated. In 1850 services expanded to South America. Several short lived routes were operated and in 1906 Owen Philipps, who later became Lord Kylsant became Chairman of the company. A joint service with Holland America Line to the Pacific coast of North America started in 1921. DESCRIPTION -- Very nice stand up 'Company Advert' from the Royal Mail Liner The Andes. The item is in very good condition and is the type of item not seen around today, and the size is 19" x 14" (48cm x 35cm) and is dated circa 1955. HISTORY -- One of three contemporary well known British cruise ships, Andes, Caronia and Reina del Mar, Andes can be regarded as one of the finest passenger ships of her time. 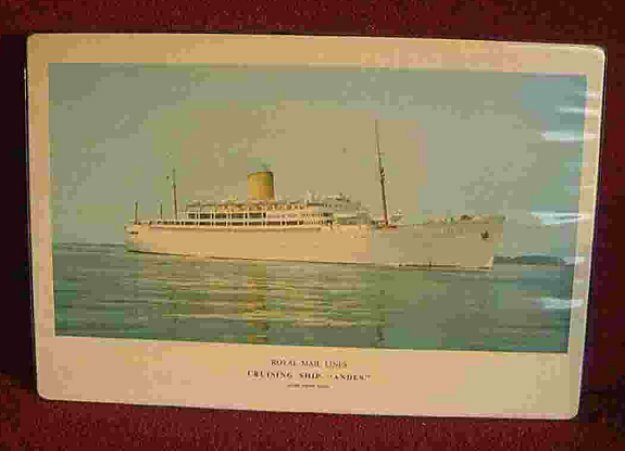 Andes could compete with Cunards famous Caronia of 1949 in terms of luxury and service. Originally, she had been built to the highest standards, as Royal Mail intended her to be the finest ship ever on the Latin American run. Andes was regarded by many as a floating club house, catering for the very rich, who returned year after year. 60% of her passengers were repeaters which developed into the foundation of the Andes Cruise Club.